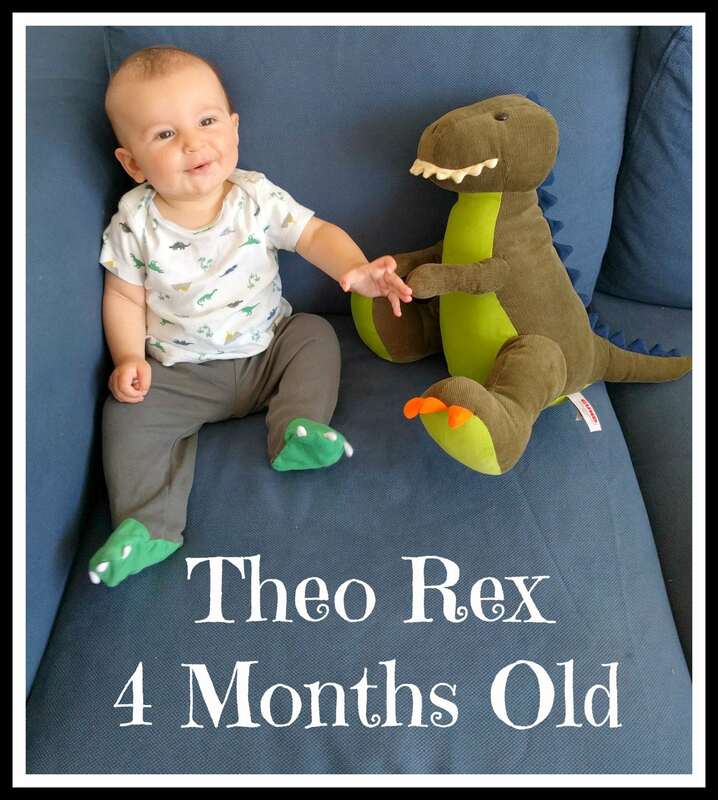 Theo Rex, at four months old, is strong and smart. He’s hungry and happy. He is a shameless flirt. I’ve lost count of how many times I’ve been sitting in a waiting room or at the train station or anywhere, and I see a woman across the way smiling and making faces at me, wide-eyed and delighted. And I always spend a couple seconds wondering why the crazy lady has singled me out for attention before I realize – Theo is in my lap and he is sharing his irresistible grin with a stranger. I returned to work full-time last week, and a lot of the past week-and-a-half has been about Dexter. He continues to be his bright and opinionated self, but Dex is very much in an adjustment period when it comes to our new routine. I will write about this in more detail later, but a lot of the focus around here has been on Dexter, lately. Boop! 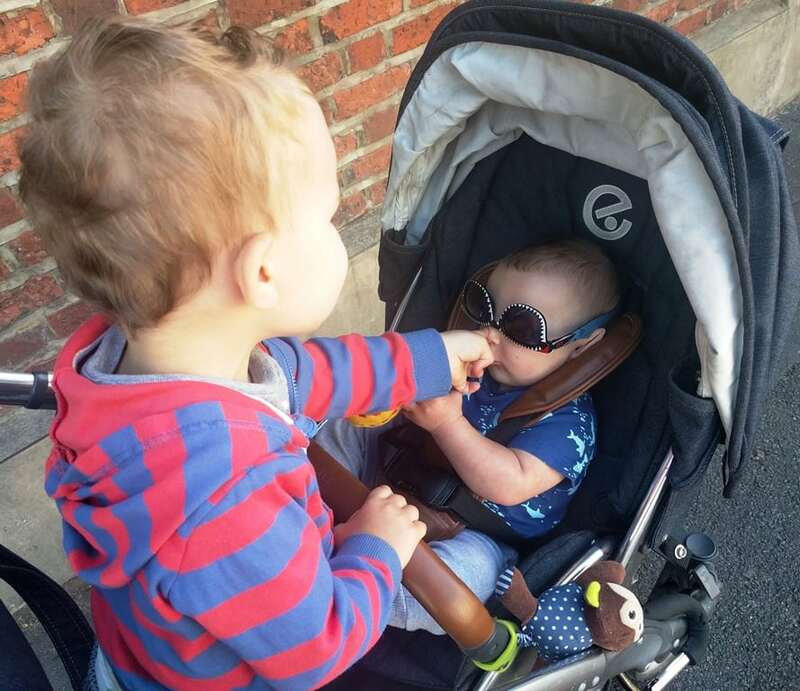 And yes, Dex put the sunglasses on Theo, just like that. The other night I was snuggling Theo before bed and noticed how perfect and tiny his little row of toes is, so I took a panicked photo, realizing they won’t be this small much longer. You’re welcome. He’s not the only one having a hard time. With our schedule changes and my commute, I’m spending significantly less time with Dex and I’m having withdrawals. All of this is unexpected, because the one I was worried about was Theo. 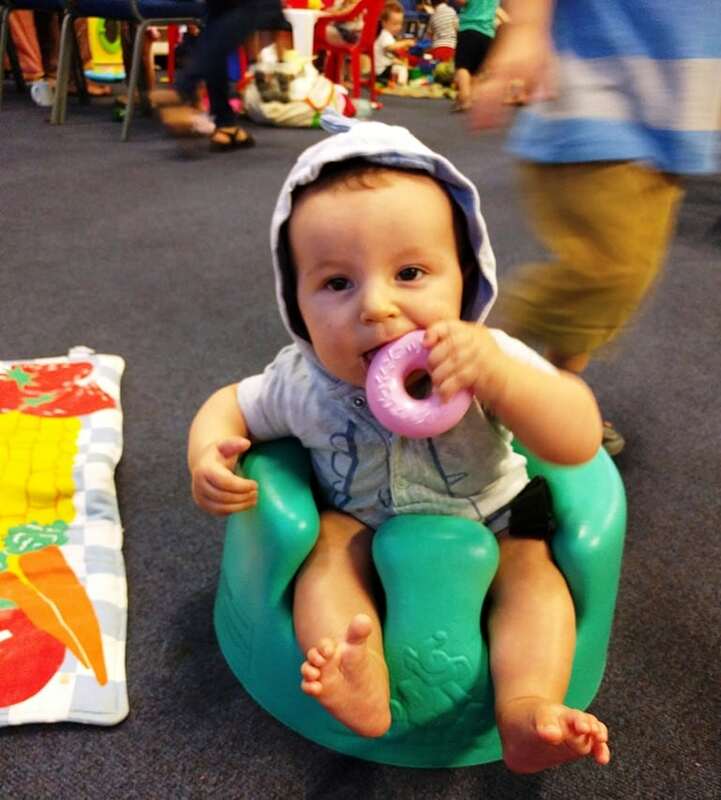 With Dex, I returned to work with flex-time at 3 months and didn’t go back full-time till 5 months, and even then I nursed Dexter every day at lunch until he was nearly a year old. By contrast, Theo is going from full time mom to working full time mom, no lunch visits or flex time, at 4 months. I worried it wasn’t “fair,” that he’d suffer from entering full time care so young. To my surprise, Theo and I have entered into a new routine that is nearly blissful, instead. Every evening, when I get home, Theo is so excited to see me he practically leaps out of Matt’s arms. We nurse until he’s full enough that I can eat some dinner — sometimes those things happen simultaneously — and then we all get Dex ready for bed. Once Dexter’s down, Theo and I hang out until it’s time to put him to bed, around 9-10 a.m. It’s not consistent but he’s sleeping longer stretches. Sometimes I get six hours in a row. And then any time after 4 a.m., if Theo wakes, I pull him into bed with me, where we nurse and cuddle and breathe together until it’s time to get up at 7. Yes, sometimes he kicks me and I can’t sleep, but it’s still an amazing couple of hours and I can’t believe my luck, to get to start my day like that. 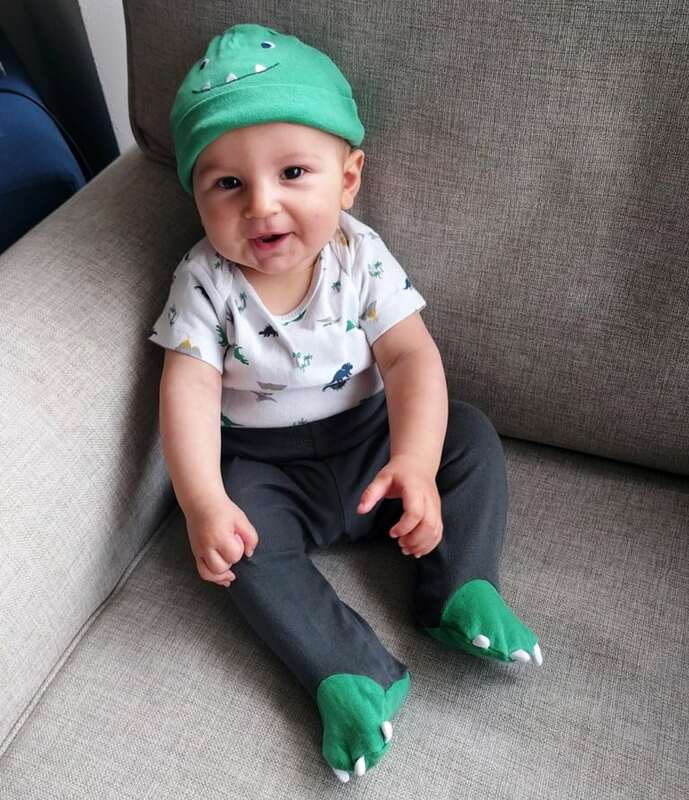 I just felt like you needed to know the T. Rex outfit he’s wearing above came with a hat, too. And I’m pretty sure it’s impossible for me to post too many photos of his little dinosaur feet. 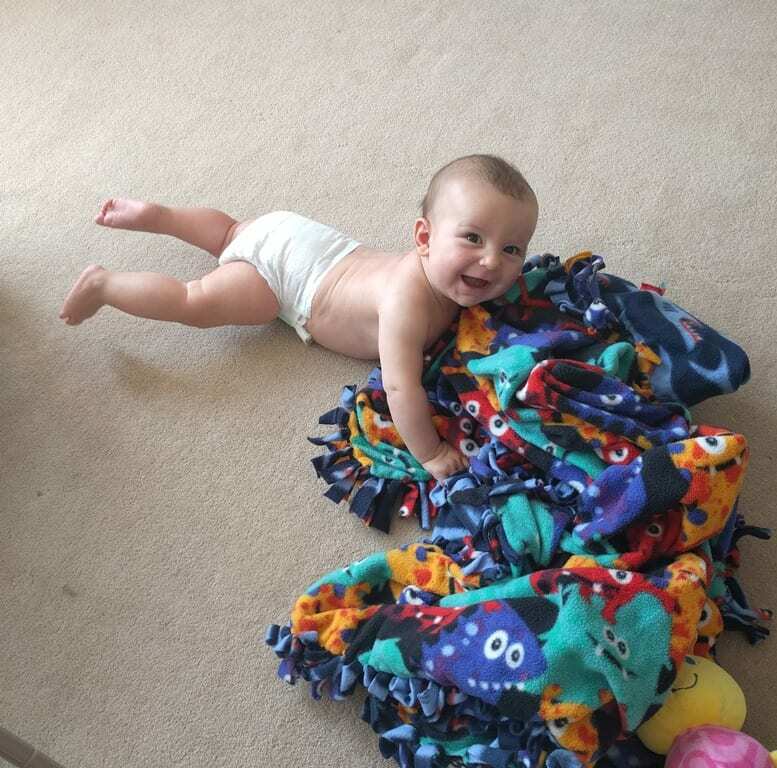 And then, when Theo wakes up for good, the first thing he does is give me that smile, the face the ladies can’t resist. T.Rex scrunches up his cheeks and laughs with his eyes and right when I’m utterly charmed and disarmed, he unleashes the gummy grin and I’m done. 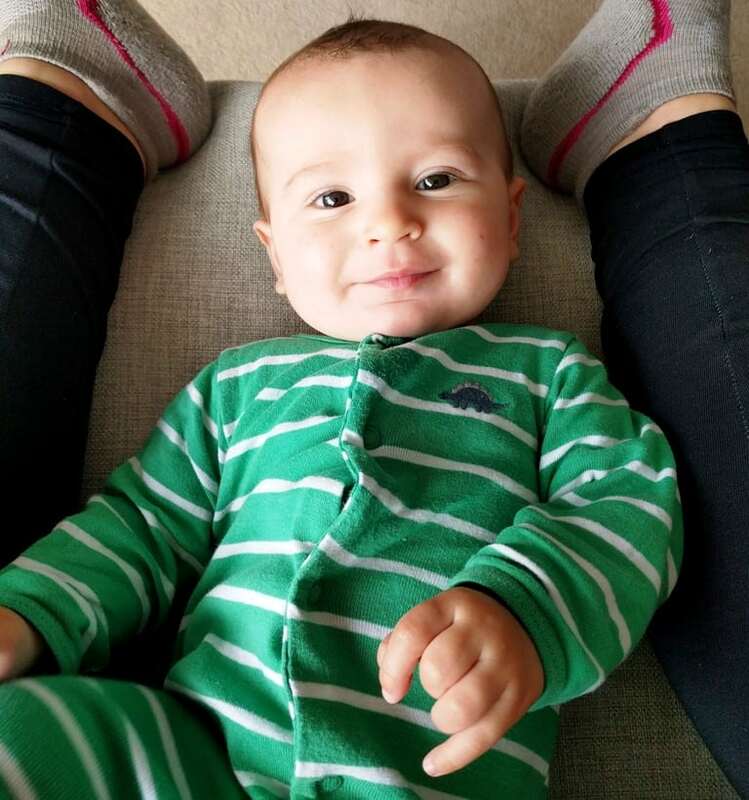 He’s only four months old, but already Theo is giving me golden moments during a time when things are hectic and hard. I can’t wait to see what he does next.